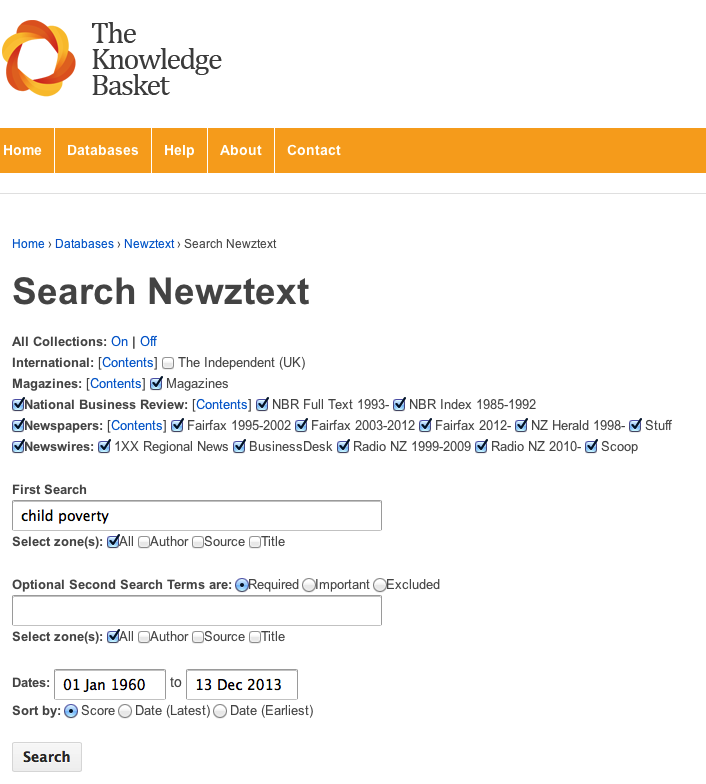 The Knowledge Basket provides a search screen designed to facilitate searching both by novice searchers, and by expert searchers. At its simplest, the search form can be used simply by entering the search words in one box, and clicking on the Search button. The easiest way to combine sets of words or phrases is to enter the next set of words in the second box, and leave the button “Required” selected. You can combine search terms in different ways using AND, OR, NOT. Note that these operators must be entered in capitals. If they are entered in lowercase, the search will retrieve on those words – for example if you enter “fish and chips” you will retrieve documents with that exact phrase in them. If you enter “fish” AND “chips” you will retrieve documents with those words anywhere in the text. Where words are entered without quotes (Eg: pacific, above) the word stems are used for retrieval rather than an exact word match. The Solr Search Engine supports a very large number of search operators. 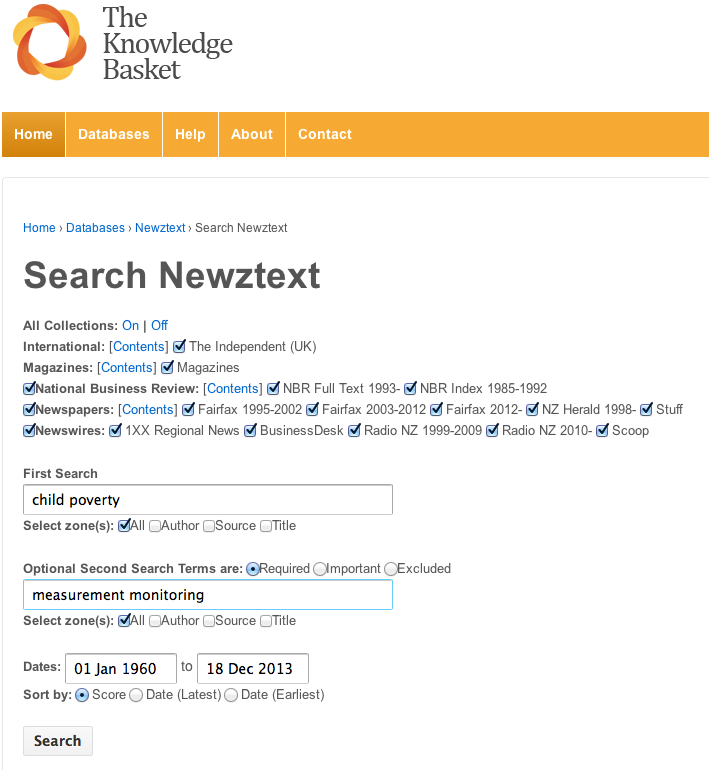 The Knowledge Basket Databases consist of several “Collections” which can be searched together or in any combination. You choose which collection to search by selecting the appropriate checkbox. Once you click on the “Search” button, you will get a list of results matching your keyword search. The results will be displayed either by score or chronologically, depending on which button you selected. You will get the date, source and title and a summary (if available) of the documents retrieved. The screen will also show you how many documents matched your search. If you click on the title, the full article/document will be displayed. Note: You may get duplicate titles showing… this is not a mistake; the newspaper publishers often send us slightly differing versions of stories depending on the edition, timing of the article’s release, collection it came from and so on. Thank you for looking at our Help screens. 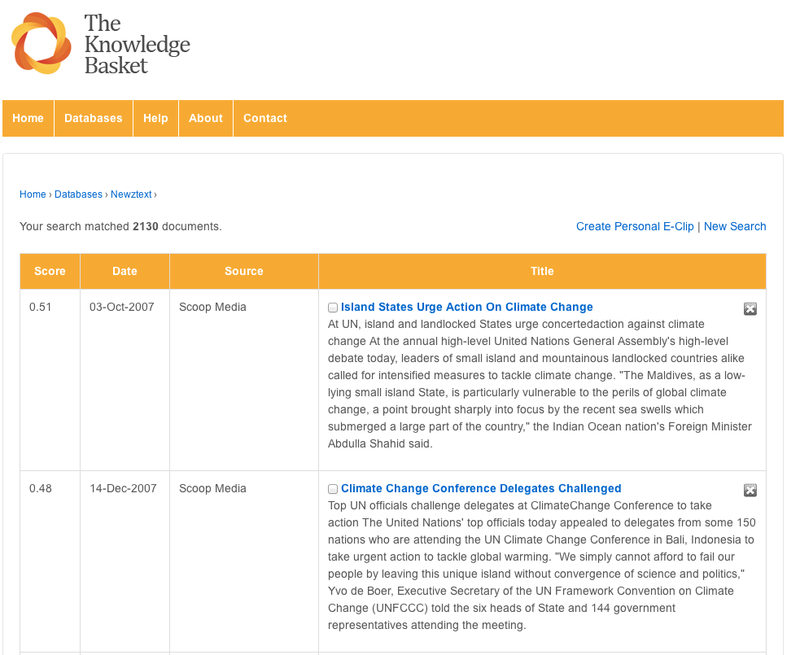 Remember there are more tips you can look at on The Knowledge Basket, and you can also view our Video Tutorials.